With cold weather right around the corner I thought this would be the perfect time to share a quick and easy crochet project with you. I loved making this infinity scarf with some of the softest yarn I've ever worked with! Since I'm sensitive to scratchy yarns and fibers, this Boa Yarn from Fair Isle was perfect. It's a Super Bulky washable yarn made of Nylon and Polyester and I promise you'll love the feel of it. It has all the softness of fur and none of the guilt! I used the free Fair Isle Infinity Scarf pattern by Ruth Hinman, but adapted it to use three colors instead of one, even though the pattern calls for just one color. You can make it in an afternoon for a gift but my guess is you'll love how it feels and looks so much you'll just want to keep one for yourself! It can be a little bit tricky to find the stitch to crochet back into as you work consecutive rows, but it's also a very forgiving project. 11 rows or 9 stitches = 4"
Should you need to frog your work remember to use the end of a smaller hook to help you untangle the fur from the knot by working from the back side of the stitch and gently working the yarn back through. I only had to pull out a few times and did it on purpose to test and it didn’t tangle, this yarn wants to behave. This is just a suggestion in case. Working with a stitch marker will make the growth of this scarf super-fast and fun. Remember, it is always best to sew 3 directions, out the length of the row in the tops of the stitches, back through your own stitches and then back through the other way one more time. 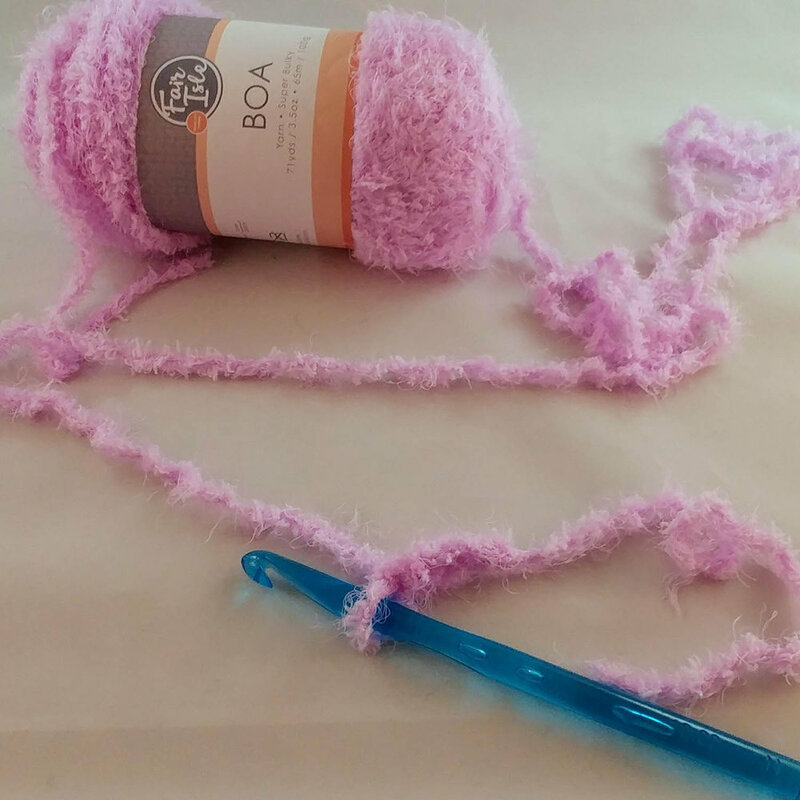 I find with fluffy yarn like Boa that finding the stitches with the point of the needle and sewing through them help me secure the yarn more tightly without changing the shape of the scarf. When washing your scarf, hand wash it with soap or another super delicate cleanser and then lay it flat on a towel to dry. Do not wring or otherwise you’ll squish the fibers. SL ST ends together to form ring. Work in the tops of the stitches of your CH ring, it should be 98" including starting CH 3. Round 1: Leave a long tail and CH 98 and join to starting CH with a SL ST then CH 3 (counts as first DC) and work DC all the way around to your first CH 3, SL ST to join. Round 2: CH 1 and DC in the tops of the stitches of the row before all the way around to your first CH 1, HDC in the top of that CH and now continue to mark the first stitch of each Round with your stitch marker because you will be working in the round and it may get confusing to see the start and finish of the Rounds. Rounds 3-11: Working in the tops of the stitches from the Round before, DC around. At the end of Round 11: SK the last DC stitch of that row and SL ST into the top of the next stitch then F/O and sew in your ends. SK the last stitch and SL ST into next. Work your needle through stitches. Fluffy clouds of guilt-free fur! 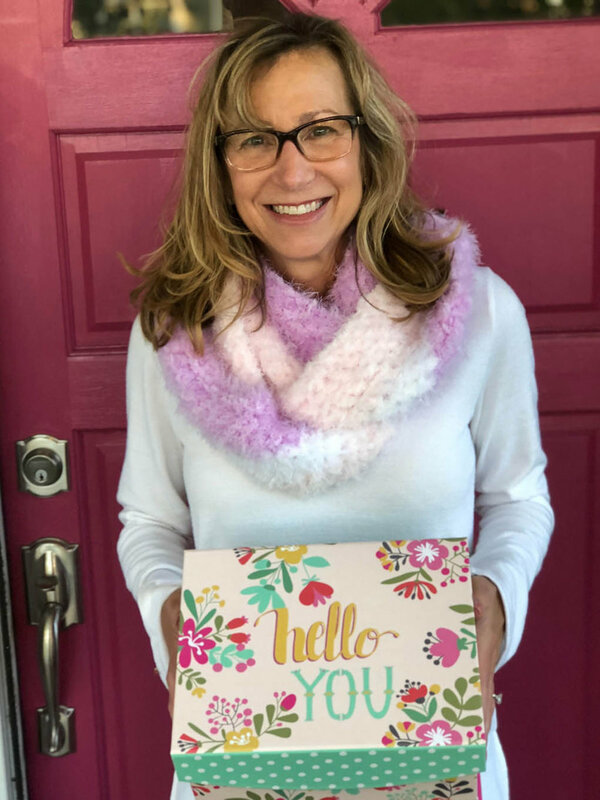 Now you have a gorgeous Faux Fur infinity scarf to keep or give that provides warmth and comfort, while being stylish and trendy! I'd love to see how your scarf turns out and hear about any favorite scarf patterns you'd like to share! The free PDF pattern for this hand crocheted faux fur infinity scarf may be downloaded here. And don't miss Fair Isle's entire library of free knit and crochet patterns! Prize bundle includes: Boa Yarn (4 Skeins), Project Bag (Happiness is Handmade), Crochet Hook (10mm), Pack of Semi-Precious Stitch Markers. Contest ended Sunday, October 14, 2018. Congratulations to our winner, Nicole Acuña!